Nothing beats the warm comforting smell of fresh aromatic spices in a spring herb garden. However, most of us who don't have the luxury of growing our own herbs. In order to infuse some of these great smells into our food, a mortar and pestle can be used to grind herbs to extract the most aroma and flavor from spices and herbs. We researched some of the best mortar and pestles for cooking and reviewed them just for you. Utilizing a mortar and pestle in your cooking is like traveling back into history. The first recorded mortar and pestle was used 35,000 B.C. This incredible design has stood the test of time and has maintained its structural integrity. ​Throughout the years, the mortar and pestle has been used for alchemy, chemistry, pharmacology, and even masonry. Ultimately, the multi-functional use and simplistic yet sleek design makes this tool a must-have for any kitchen. In order to choose the best type of mortar and pestle, you need to know the materials these handy tools are made of. If you're looking for the perfect traditional molcajete for making delicious guacamole, you're in for a treat. This gorgeous mortar and pestle is made from all natural porous stone harvested from real volcanic rock. Not only is this product all natural, it also provides the perfect grinding surface for your favorite dishes. The Molcajete measures 8-1/2-inch diameter by 5-inches tall; tejolote is 4-1/2-inches long with a 2-1/2-inch diameter grinding end. In case you're not familiar with using this product, an informational booklet is included as well. Also, simply scrub and wash clean with soap and let dry. 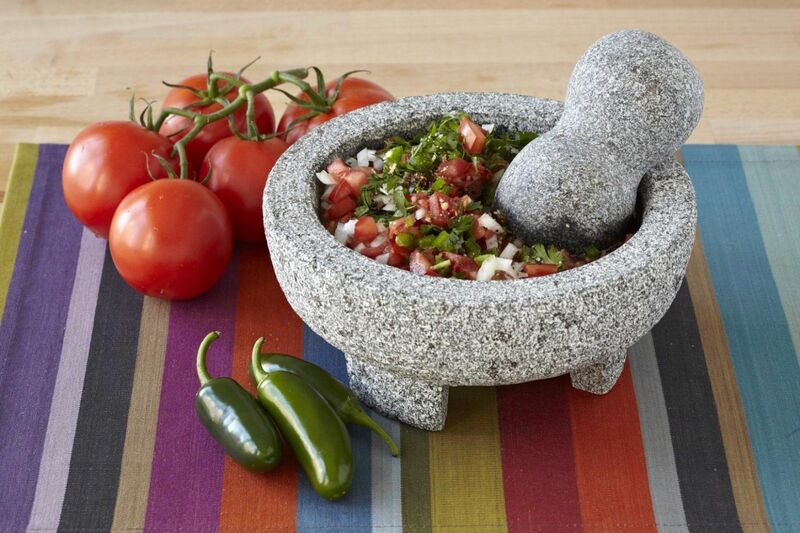 Overall, this molcajete mortar and pestle is the perfect addition to your kitchen tools. Want to make delicious restaurant quality guacamole in the comfort of your own home? Well, you're in for a treat. This traditional molcajete style mortar and pestle is the perfect grinding surface for your guacamole making needs. This molcajete is made from natural volcanic rock, which allows your foods to release their natural flavors when grinding. The stone itself has a 8.5" diameter making it perfect for feeding a family. The pestle also is double ended so you can use the thicker end for grinding larger foods and the smaller end for grinding finer spices. In the end, we know you will absolutely love this mortar and pestle. Whether you're just getting started in Mexican cuisine or you are a professional, this is definitely the perfect addition to your kitchen. For those of you who love fresh herbs, you're going to definitely want to check this mortar and pestle out. As a huge fan of Jamie Oliver, I personally was very excited to see this product on the market. 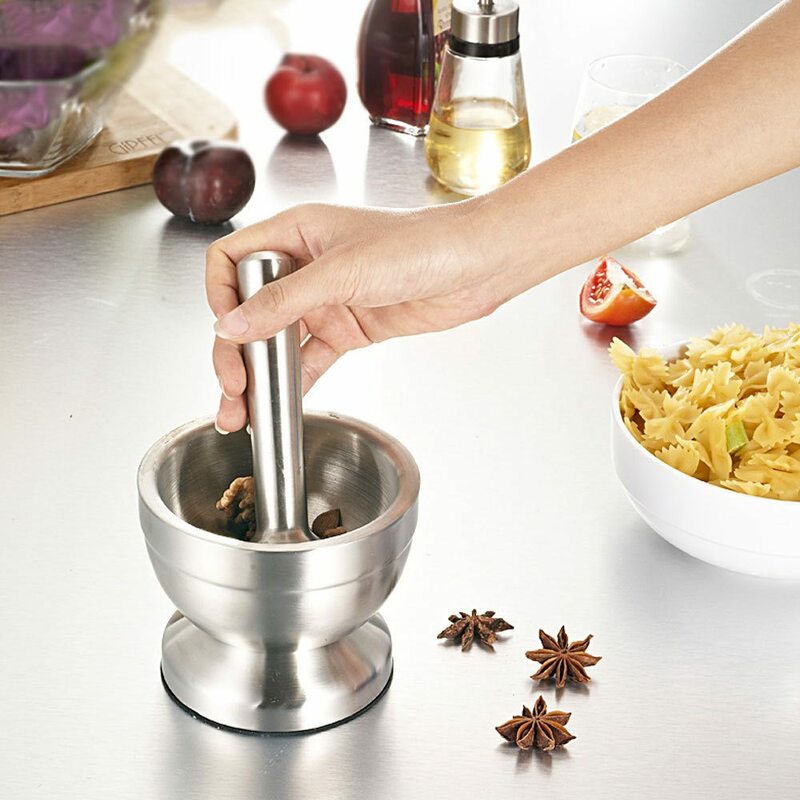 Not only is this mortar and pestle beautiful, it is also extremely efficient for grinding herbs. Since the porous stone is unfinished, it makes grinding wetter fresh herbs much easer and releases the natural flavors and aromas from the herbs. Before using, be sure to season the mortar with white rice, followed by garlic then cumin with salt and pepper. In conclusion, you will absolutely love this mortar and pestle. Next time you decide to cook with fresh herbs, be sure to use this handy tool. Mortars and pestles have been around in cooking for thousands of years because of their utmost efficiency. Why change something that works? That's why this beautiful unpolished granite mortar and pestle set by ChefSofi is one of the best on the market for grinding fresh herbs. Because the granite rock is unfinished, the porous texture allows fresh herbs to be manually ground, allowing them to release beautiful aroma and taste. Also, the surface is much easier to handle since it acts as a natural grip when grinding. Clean up with this mortar and pestle is a breeze. All you have to do is wipe clean with water and a sponge and you're ready for the next use. 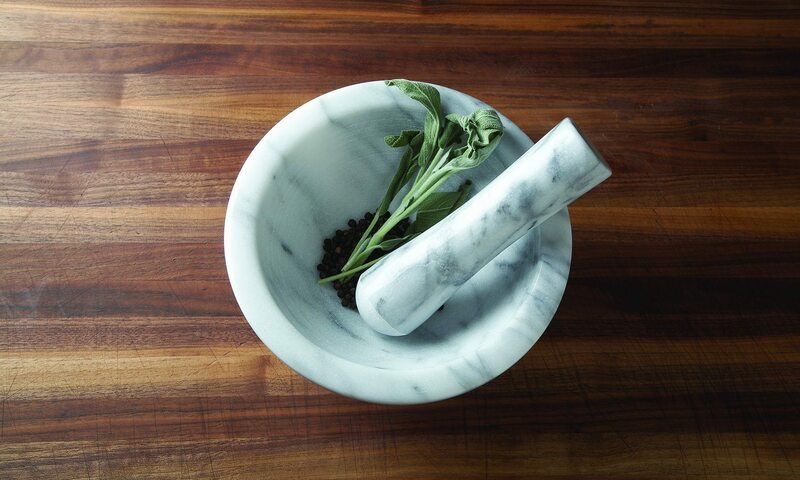 Overall, we absolutely LOVE this mortar and pestle set for grinding the freshest of herbs. One of the best types of mortar and pestles from grinding spices is a marble mortar and pestle. In this case, Fox Run makes a gorgeous mortar and pestle perfect for grinding fresh spices quickly. 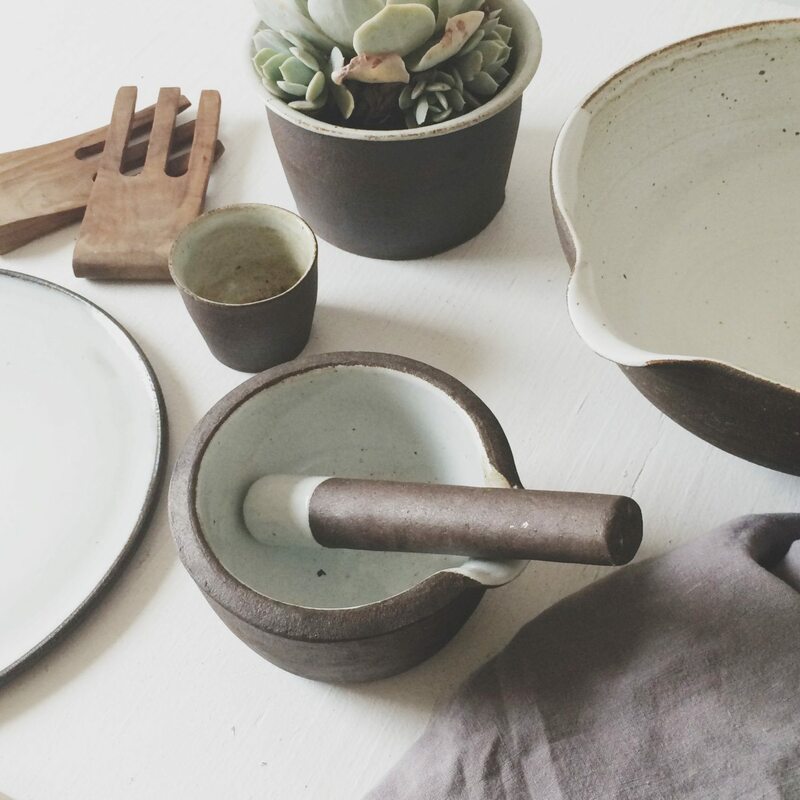 Although small, this mortar and pestle is most certainly mighty. The set is made entirely of 100% marble and shows with its unique patterns and colorations. The small sleek design is perfect for spices and pastes. Also, washing this mortar and pestle is a breeze simply by hand washing with soap and water. In the end, we were very impressed with the overall quality and efficacy of this product. If you're looking for the perfect mortar and pestle set for grinding spices, this is the set for you. 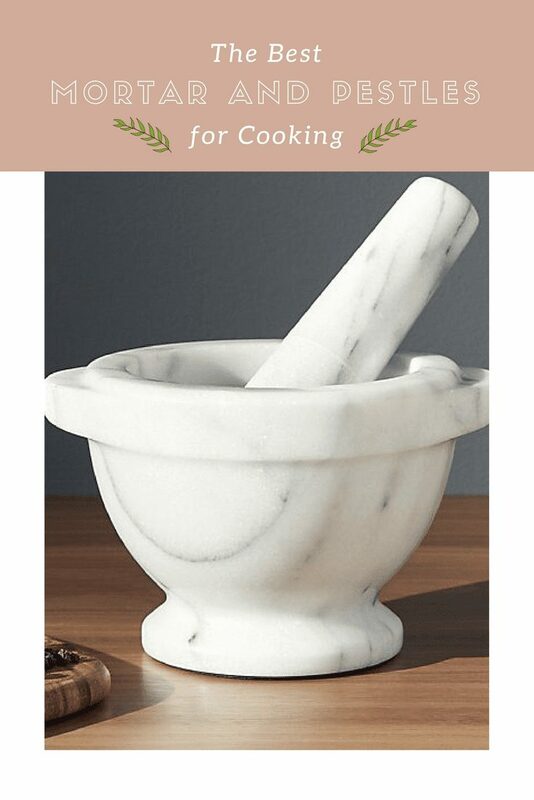 This stunning white marble mortar and pestle set is made from 100% natural marble. The product itself is extremely sturdy and non-porous, which allows you to grind really fine spices without losing any in the stone. The wide interior of the mortar, 5.25” Diam. X 4.5” H, and ensures the ground spices won't fall out of the sides easily when grinding. All in all, this is a great mortar and pestle to use. Whether you're a professional chef or at home cook, you will love this addition to your kitchen tools. First off, if you know anything about saffron it's that it is one of the most expensive spices in the world! Because it's so expensive, you definitely don't want to ruin your saffron spices with the wrong mortar and pestle. Fear not, this gorgeous brass mortar and pestle is the perfect one for you! This authentic brass India mortar and pestle measures as follows: Mortar Height 2" to 2.5" inches, Mouth Diameter 2.5" to 3", Base Diameter 2 to 2.5" Inches, Pestle 5" x 0.5" to 1" Inches. This small size is perfect for grinding small amounts of saffron and won't let the spices spill over while grinding. It is also very easy to clean and wash wish soap and water. In the end, you will love this brass mortar and pestle whether it's for trying out traditional Indian recipes with clay pot cooking or just at home cooking fun! For those of you who want to up your Indian cooking game, this is the perfect mortar and pestle for you. Since saffron is commonly used in Indian cooking, you will find that a sturdy brass mortar and pestle will work best when grinding this delicate spice. 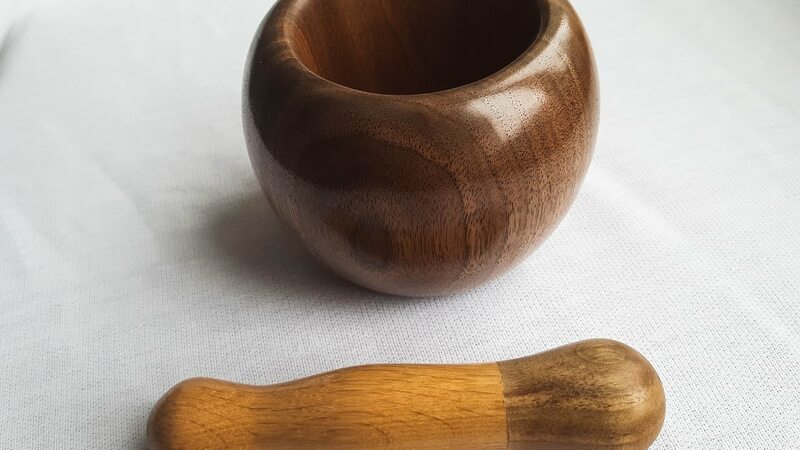 The mortar and pestle measures 2.75 inches high with an opening 2.75 inches in diameter making it easy to grind small amounts of saffron without it spilling over the sides. Also, the brass has beautiful ridged motifs along the sides making it very aesthetically pleasing to the eye. All in all, this is a beautiful mortar and pestle that not only looks good on your shelf, but also makes the best of your saffron. If you want to start using fresh saffron in your Indian cooking, this is the tool for you!